One of the things I’ve learned is that in order to be the active and engaged grandpa I want to be, I’ll need to be in better shape. My answer has been to improve my nutrition, reduce my weight, and to include a 30-60 minute brisk walk at least 5 days per week. My plan delivered great results – releasing fifty pounds, reducing by fifty inches, increasing energy, and feeling like I was twenty years younger. Good start. More variety needed. Unfortunately, a more diversified fitness plan is needed for the long haul. Studies have shown that aerobic exercise – in my case brisk walking – isn’t enough for optimum health. For optimal long-term success, we’re now encouraged to add resistance training, stretching, and more. Frankly, spending hours, day after day, in a gym doesn’t sound appealing to me. So I was excited to learn about Dr. Paul Arciero’s RISE Protocol for achieving fitness goals. 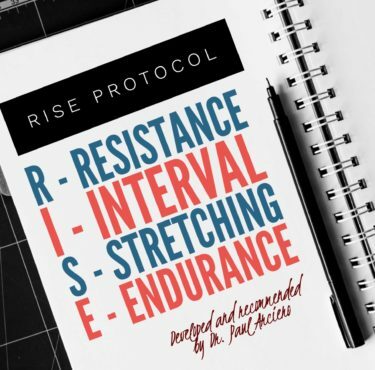 The RISE Protocol is a scientifically backed exercise program that incorporates several methods of exercise, along with scheduled rest days, throughout the week. You’ve got to love a plan that builds in rest days! Grandpas, we can do this! Learn more about the RISE Protocol here.